Synonyms: Diospyros ebenaster, Diopyros nigra. 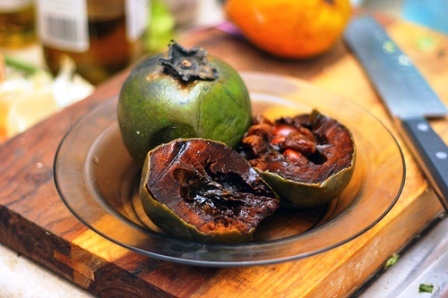 Black sapote originated in Central America. With time, it reached many parts of the world and now is being grown in the Philippines, Malacca, Maurius, Hawai, Brazil, Cuba, Puerto Rico and the Dominican Republic. This fruit is also called chocolate pudding fruit because it makes an excellent pudding that looks and tastes like a fine chocolate mousse. A handsome evergreen ree upto 25 m, with a furrowed 70-80 cm wide and black bark. Leaves, alternate, elliptic-oblong to oblong-lanceolate, tapered at both ends or rounded at the base and bluntly acute at the apex, leathery, glossy, 10-30 long. Flowers axillary, borne singly or in groups of 3 to 7, tubular, lobed, white, 1-1.6 cm wide, calyx, persistent, green, some have both male and female organs; calyx large; fragrant. Fruit bright-green and shiny in the beginning; oblate or nearly round; 5-12.5 cm wide; calyx prominent, 4-lobed, undulate, 4-5 cm across, clasping the base; after ripening the smooth, thin skin becomes olive-green and then rather muddy-green; pulp glossy, brown to very dark-brown, almost black, somewhat jelly-like, soft, sweet, flavor mild, often seedless. Seeds 1 to 10, flat, smooth, brown, 2-2.5 long. 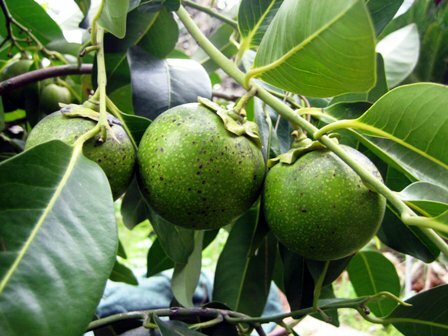 The fruits are eaten when fully ripe and soft. The pulp, which is contained within a thin skin, is soft, sweet, smooth and pale brown in colour. When scooped out and stirred, the colour changes to chocolate brown. Apart from being eaten fresh, the pulp may be made into a drink by blending with citrus, vanilla, or other flavours. It is also used in ice-cream, cakes and liqueurs. The unripe fruits are inedible, caustic and bitter. These have also been used as fish poison in Philippines and the West Indies. The wood is yellowish to deep-yellow with black markings near the heart of old trunks; it is compact and suitable for cabinetwork, but is little used. 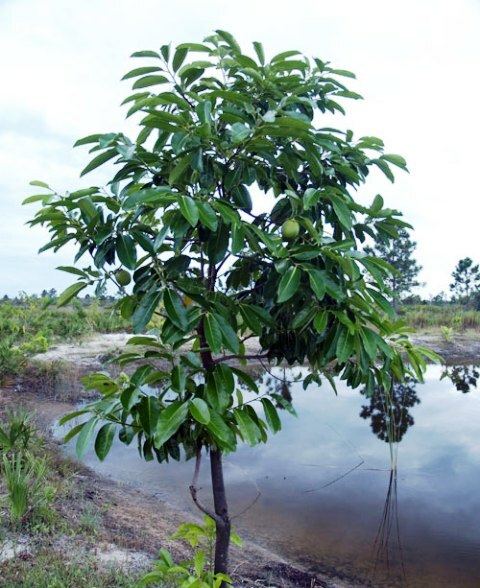 Black sapote trees are vigorous growers. These should be spaced 10-12 m apart. This fruit is a heavy bearer and can bear sizeable crops with very less attention. The fruit turns a duller colour when ripe and the persistent calyx at the base, which is pressed against the developing fruit, becomes reflexed. At this stage the fruits are still firm. They soften 3-14 days after harvesting, and must be distributed beforehand because soft ripe fruits are difficult to handle. Individual fruits ripen suddenly and unpredictably within 24 hours. Harvested fruits can be stored for several months at 10 deg. C. When removed from cold storage and placed at tropical room temperature (about 29 deg. C), they will soften within 48 hours. Black persimmon is a good source of vitamin C, calcium and phosphorus. It is hardy tree requiring very less care.. It is also heavy bearer. So it has a potential for being developed as a new commercial fruit crop.